Well hello to you my reader chums! 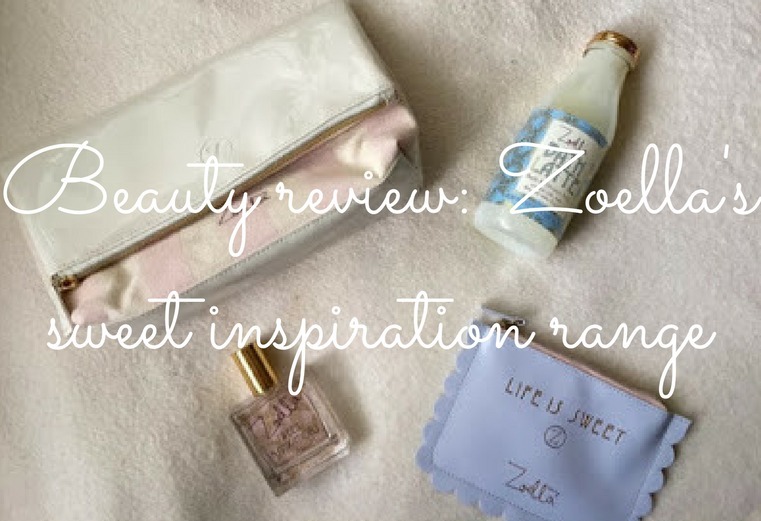 For today's post, I've got a review of the new Zoella Beauty range, 'Sweet Inspirations'. When the collection was announced, I was rather excited because not only did it look absolutely adorable, the scents were all based around sweet things, suiting me perfectly. I've got both of Zoe's previous ranges so couldn't wait to get my hands on a few bits when they were released. I initially bought three items after the launch; the bath latte, fragrance mist and coin purse then received the clutch bag as a gift. The first product I picked up was the stunning 'Bath Latte'. This has to be the cutest looking bubble bath bottle I've seen, it reminds me of vintage milk bottles with a shiny lid. As I adore my baths and lush products, I couldn't wait to try this out! I have to admit, it exceeded my expectations; once pouring the liquid under water, an array of bubbles formed and the sweet scent lingered for ages. I'd describe the scent as a combination of almonds and the overall smell when you walk into a sweet shop. It's like soaking in a bath of marzipan, leaving your skin feeling soft and smelling lovely all day long. For one bath, I used about a sixth of the bottle and after the bubbles grew, they lasted for ages, holding in the sweet goodness. Love, love, love! Another item I bought was the coin purse/pouch as the design was too cute for words. With the scalloped edges and lilac colour scheme, it gives off a mermaid-esque vibe. 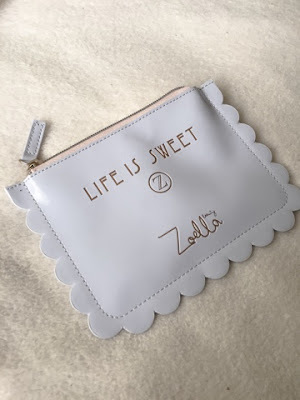 As it's quite a small bag, designed to put nick nacky bits in, I've liked to use this to store contact lenses in when travelling or slot it in my handbag for everyday essentials. The whole concept behind it is very practical and I love the quote 'life is sweet', simple but effective. One of the products I've been obsessed with is the 'Sweet Inspirations' body mist. The scent of this spray is delicious, I could smell it all day long. I've been using the fragrance continuously as part of my everyday routine, I just can't get enough! Despite only being a mist, the scent lasts quite a while throughout the day. I love the packaging of this too, the glass bottle, gold lid and pattered background, provides an elegant, more expensive look to the overall product - for the quality and design, the price is brilliant. 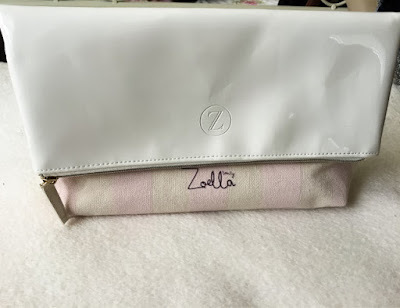 Last but not least is the gorgeous clutch bag. What I love about this is its versatility; you can either wear it folded over on a day basis or use for storage purposes when stretching out to its full size. I haven't gave it a go yet, however I think it'll really come in handy to pack all my beauty bits on my next trip in August. The design is super stylish, I love the blend of stripes, pastel colours and the wash of white shine. 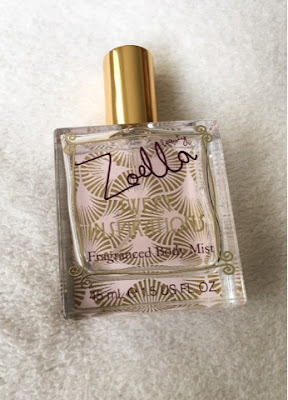 I hope you enjoyed my review of Zoella's new range. Have you tried any of these products? 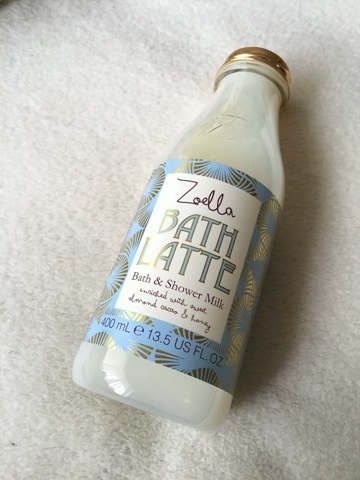 I love the bottle of that bath latte, it's adorable. 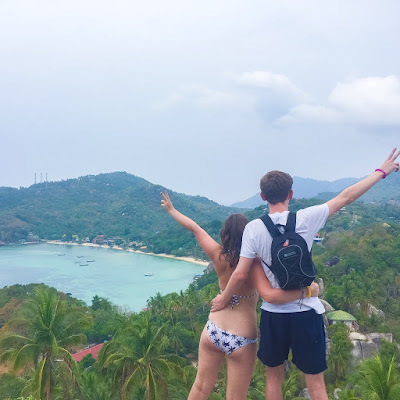 If I had it it would be in the background of all of my photos from now on haha! Everyone loves the scent of this range, I need to go sniff it in Superdrug! I absolutely loved the original Zoella body mist, and I can't wait to try the new one! I love a sweet fragrance, this sounds gorgeous. I haven't tried any of these products myself but the Bath Latte looks absolutely adorable! It really reminds me of the old fashioned milk bottles as well.